How could you miss the big party on the 30 th of September this year? The one that is celebrated by about 1500 million people on this planet! Oops ,…… probably because you are not aware, as I, and are of western origin. If there is Taiwanese, Vietnamese or Chinese blood flowing trough your veins you will likely have celebrated this mid autumn feast with your family. The “MOON CAKE FESTIVAL or ZHONGQIU FESTIVAL”, “is a time to watch the moon together, to recite poems, to be romantic, to start a family or to be together as one. Houyi and his wife, once gods, were condemned to mortality, and had to live as humans. As a reward for arching nine suns out of the sky, which doesn’t sound easy to me, Houyi received am immortality pill. In a moment of panic, Chang’e, his wife, swallowed the hidden pill . She immediately flew away, as she was being chased by Houyi she hid on the moon. Houyi later build his house on the sun, and they reunited as Yin and Yang for one night every year as a perfect full moon. This feast is big like Christmas, and dates back at least as far as the Han Dynasty, 220-206 BC. Celebrated outdoors by some in a slightly modern western way with a BBQ, lanterns and candles are lit, preferable with a clear moon lite sky. 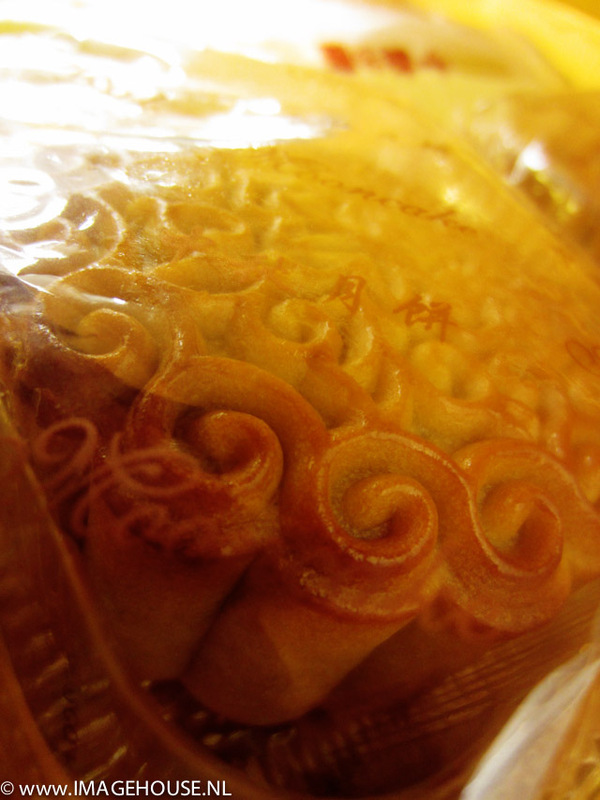 Shopping in London’s “China town” the last 29 of September, I came across supermarket shelf’s packed with moon cakes. These sweet little master peaces of pastry are a treat, even better with a sip of Chinese wine, as I was told. They go for prices from 16 to 26 pound, 20 – 32 euro, 26 – 42 dollar, and up for a box of four lacey like sweetness. Found a recipe on the net, if you feel up to the task give it a try and let me know. Otherwise go and find a friend among the one and a half billion, (Dutch 1,5 miljard), who traditionally celebrate the MOON FESTIVAL. The next date is set for the 19th of September 2013, so you have plenty of time. Looks delicious! And what a wonderful story behind it!